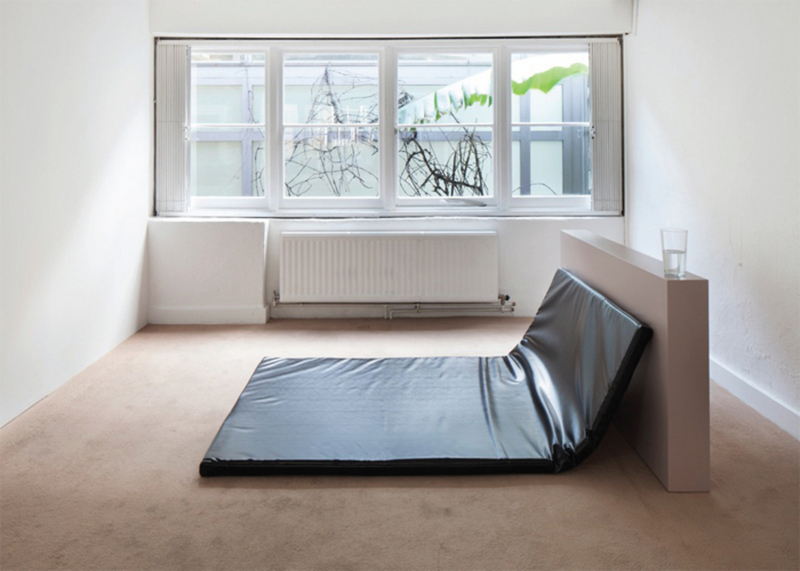 Prem Sahib, Night Flies, 2013, crash mat, spray-painted wood, pint glass with water, 33 7/8 x 74 3/4 x 51 1/8". The prelude to Prem Sahib’s recent exhibition “Night Flies” was “Bump,” a kind of buzzing pop-up club that opened one summer evening and remained until the wee hours. Having used the Southard Reid gallery, normally closed in August, as a studio that month, he then transformed the space into a private club for a single night. He created a blue-lit chill-out room on the ground floor, and wall-to-wall tan carpet covered the upstairs room, which was also fitted out with a large revolving mirror ball; the rear office became a crowded bar. Order the PRINT EDITION of the December 2013 issue for $17 or the ONLINE EDITION for $5.99.